NASA’s Aqua satellite and the NASA/NOAA Suomi National Polar-orbiting Partnership satellite discover a massive iceberg splitting off from Antarctica’s Larsen C ice shelf. The first available images of Larsen C are airborne photographs from the 1960s and an image from a US satellite captured in 1963. The rift that has produced the new iceberg was already identifiable in those pictures, along with a dozen other fractures. 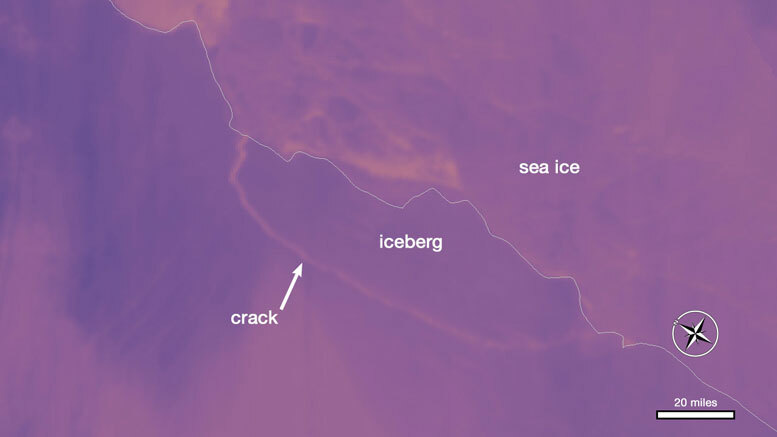 The crack remained dormant for decades, stuck in a section of the ice shelf called a suture zone, an area where glaciers flowing into the ice shelf come together. Suture zones are complex and more heterogeneous than the rest of the ice shelf, containing ice with different properties and mechanical strengths, and therefore play an important role in controlling the rate at which rifts grow. In 2014, however, this particular crack started to rapidly grow and traverse the suture zones, leaving scientists perplexed. “We don’t currently know what changed in 2014 that allowed this rift to push through the suture zone and propagate into the main body of the ice shelf,” said Dan McGrath, a glaciologist at Colorado State University who has been studying the Larsen C ice shelf since 2008. McGrath said the growth of the crack, given our current understanding, is not directly linked to climate change. While the crack was growing, scientists had a hard time predicting when the nascent iceberg would break away. It’s difficult because there are not enough measurements available on either the forces acting on the rift or the composition of the ice shelf. Further, other poorly observed external factors, such as temperatures, winds, waves and ocean currents, might play an important role in rift growth. Still, this event has provided an important opportunity for researchers to study how ice shelves fracture, with important implications for other ice shelves. Be the first to comment on "Delaware Sized Iceberg Splits Off from Antarctica’s Larsen C Ice Shelf"